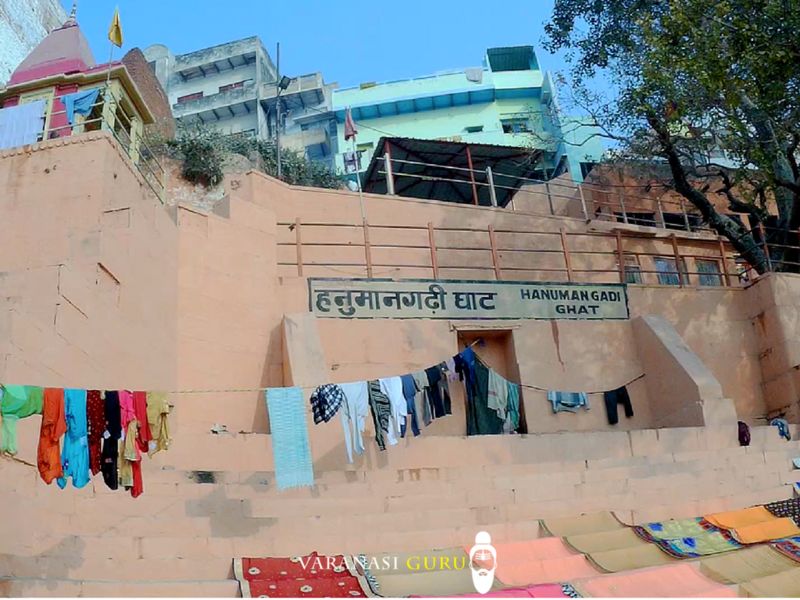 Hanuman Gadi Ghat is a new addition to the long list of ghats in Varanasi. Earlier, it was part of the Gaay Ghat and locals used to wash their cows here. This part of the ghat had no religious importance and was inhabited by Shyamalal Mahatyagi Baba of Bihar. In 1950 Baba built a Hanuman Temple here with the help of Hanuman Gadi temple Trust, Ayodhya and that’s how this Ghat got its name. In 1972 a discipline of Shyamalal Baba made this ghat pucca and people started using it for bathing and meditation. Thereafter in 1980, another discipline built a small monastery on this ghat in honor of Shyamlal Baba. The monastery is called Mahatyagi Ashram and its still operation. After the opening of Monastery, the Hanuman Gadi Ghat got its final shape. Till this date, it is dominated by the red vicinity of temple and monastery. The monastery provides free classes, food, and shelter to its students. One can learn yoga, Astrology, and Sanskrit from here. The upper part of ghat has a wrestling ring by the name of Ganga Akhara and locals play Dangal(wrestling) here. Apart from the presence of Hanuman Gadi temple, this ghat holds no religious or cultural importance. Hanuman Gadi Ghat is located near Gai Ghat road in Ghasi Tola area. It is well connected to all the Railways stations, Airport and the bus stand via road. You can reach here by shared auto-rickshaws which are available from Maidhagin Chowk. One can also take a boat ride from any ghat to the Gaay Ghat.